The computer repair and services in Etawah are offered for all leading brands of computers and laptops, which include Samsung, ASUS, HCL, Intex, Compaq, Lenovo, LG, HP, Dell, Acer and IBM. 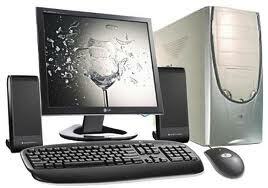 Repair and services at the computer stores of Etawah include computer motherboard repair and services, computer software installation services, computer networking, computer hard disk data recovery service, computer printer repair and services, CCTV installation services, network marketing and keyboard repair. Mobile phone repair and services as well as repair and services for refrigerators, washing machines and LCD televisions are also offered at the computer shops of Etawah. Many Etawah computer repair and services stores also deal in assembled computers, Computer hardware, LCD monitors and computer printers. Internet data cards and postpaid mobile phone SIM cards of service providers like Reliance and Idea are also available at the computer stores in Etawah. We deals in all ( Sales , Service And Mantinance Provider by Qualified Engineer ) for Laptop, Desktop, Printers, Projector, CCTV, EPABX and Networking... Accessories, Peripherals... All Products with best customer end support....Etc.For Enquiry call in 9456002121, 7017664412Email pcsetw@gmail.comYou can also search on Google Map Perfect Computer Solution Etawah..